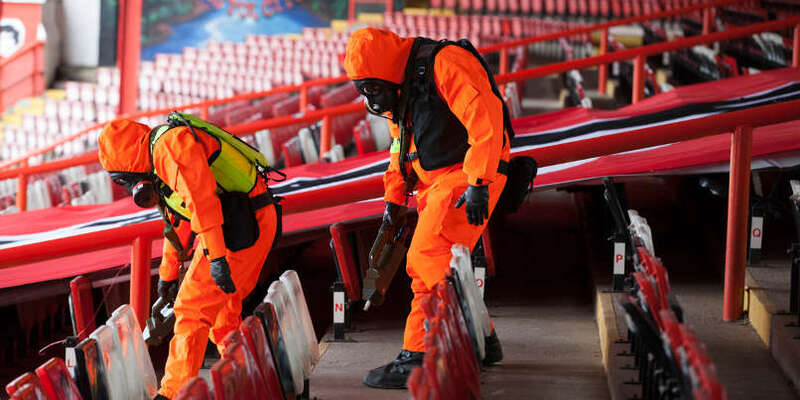 Argon Electronics' range of CBRN response training simulators has received high praise from the Police National CBRN Centre, following a recent chemical weapon threat HazMat training exercise at the Bristol City Football Ground in which trainees were required to provide security and safety for a half-marathon event. The use of simulators brought a degree of realism to the exercise from the very start, with the release of simulated chemical agents taking place even while the commanders were still delivering their briefings, as Officer Paul Lacey from the Avon and Somerset Constabulary Police Headquarters, explained. "To the trainees listening, who may have been thinking 'It's only an exercise, they'll start in a minute,' the sudden sound of a hundred people screaming and the sight of smoke billowing out of the stadium soon woke them up," he said. "This realism was supported by the use of the Argon equipment because it enabled the trainees to start trying to locate the source immediately. "With live simulants such as deep heat you have to be so close to it for it to activate that it is unrealistic. Whereas with the Argon simulators the trainees would start getting hits as soon as they came into the stadium." As Officer Lacey explained, while it is possible to simulate some forms of chemical threat with special liquids, these simulated substances don't always lend themselves to repeated training as they can cause lasting contamination. "A better way to simulate the threat is to use electronic detector simulators that look, feel and function exactly like the real detectors but respond to safe electronic sources," he said. "People learn better from practical training and that's why the simulators are so good. You're training not only physically, but emotionally - gaining familiarity with the equipment and coping with the reactions to a frightening scene. Staging an exercise like this is the nearest we can get to reality. Nothing else we do can get close." The use of advance intelligence also had a significant part to play in improving the quality of the training, he said. In this case the trainees were advised of a possible chemical weapon threat at the event and were warned that there were likely to be different factions in attendance, with tensions in the local area having been apparent for some weeks. "Setting up before the simulated incident doesn't make it any less realistic, as long as there's a reason for it. "True, there will be many incidents in real life where planning isn't possible, but there are also many incidents where intelligence tells you to expect an incident." The Argon equipment was loaned for the exercise by the Police National CBRN Centre which oversees the Police's capacity and capability to deal with CBRN incidents. The inventory comprised a variety of CBRN training simulators, including Argon's PlumeSIM system which enables a single instructor to configure simulated chemical and radiological releases across a wide area. The instructor was also able to monitor and manage multiple trainees, in real time, from a central location.